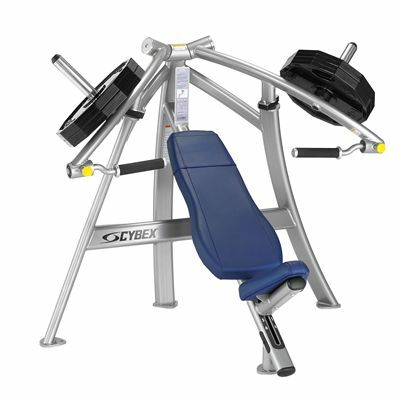 The Cybex Plate Loaded chest press features the 25° converging pattern that provides exceptional range of motion with consistent torque at the joint. The machine also offers independent arm movement that enables balanced strength development, whereas the overhead pivot guarantees more natural path of motion. The machine’s two-position selectable starting position ensures comfortable workouts for a greater range of users. Additionally, the chest press is supplied with extra-sized grips that minimise pressure on the hands ensuring more comfort. The machine is compatible with Cybex Olympic weight plates (not included). for submitting product information about Cybex Plate Loaded Chest Press We aim to answer all questions within 2-3 days. for submitting product information about Cybex Plate Loaded Chest Press. We aim to answer all questions within 2-3 days. If you provided your name and email address, we will email you as soon as the answer is published. for submitting product review about Cybex Plate Loaded Chest Press.